B990 and B990-CP Heavy Duty Chair by Boss - Free Shipping! This heavy duty office chair from Boss Office Products features a 5" thick padded seat for comfort, contoured cushions to improve posture, built-in lumbar support, pneumatic seat height adjustment, tilt with adjustable tilt tension, a sturdy steel frame with padded armrests and 3" dual wheel casters for mobility. Choose from durable commercial grade black fabric or soft black vinyl for easy clean up. The fabric chair has a silver frame and the vinyl version has a black frame. This chair is rated to hold 400 lbs. Dimensions: Seat Size: 23.75"W x 20"D. Back Size: 26"W x 25"H. Seat height adjustment: 19.5-22.5"H. Warranted by Boss Office Products. 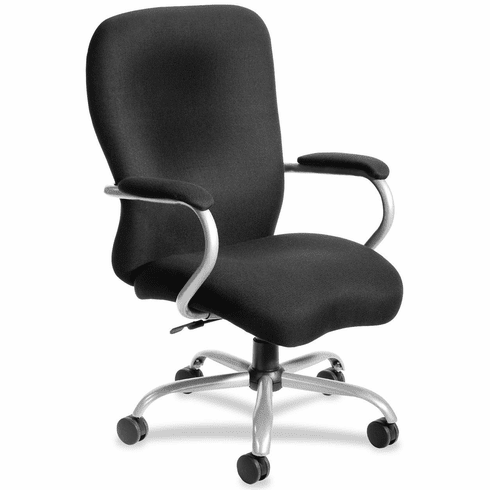 These heavy duty office chairs normally ship in 2-3 business days from our CA or GA warehouse.